In an earlier post I wrote about how to authorize the script Execute statement and the differences between QlikView versions 11 and 12. 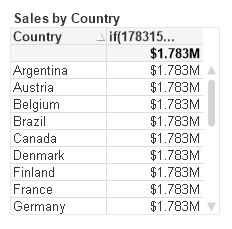 I’ve just tested the new QlikView v12.10 Initial Release and the rules have changed again. To run an Execute statement in QV12 Desktop requires that “User Preference, Security, Script (Allow Database Write and Execute Statements)” be checked on. This is also true in QV12.10. An additional Script Setting “Can Execute External Programs” is present in QV12 but had no effect. In QV12.10, this setting behaves as it does in QV11. If off, you will be asked to authorize when the Execute statement is encountered in the script. For an Execute to run in QV12.10 Desktop without prompting, both “Script (Allow Database Write and Execute Statements)” and “Can Execute External Programs” must be on. The value is set in “C:\Windows\System32\config\systemprofile\AppData\Roaming\QlikTech\QlikViewBatch\settings.ini”, and it is off by default after install. Does QV12.10 Server need the “Can Execute External Programs” setting? No. As a matter of fact, if it’s off, the reload sets it on. I don’t mean temporarily. I mean it sets and saves it in the qvw. What is the intent behind this QV12.10 change? I’m not sure. Summary: I suggest a simpler syntax for merging selections from multiple states. 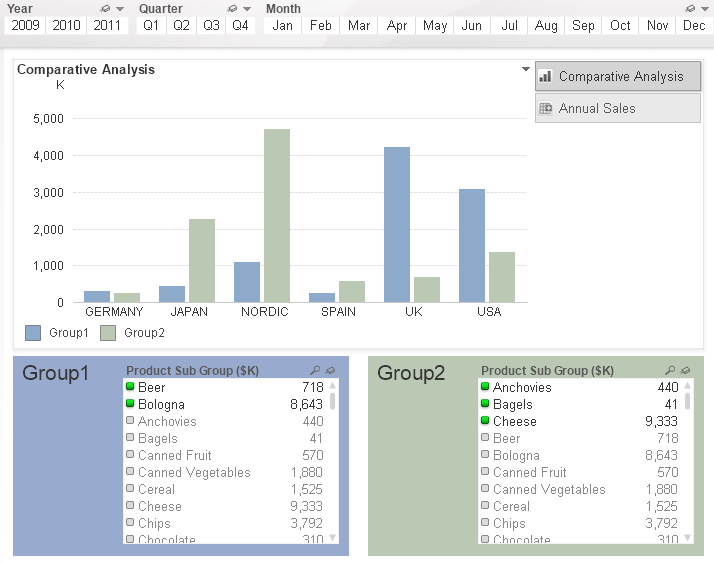 You may be familiar with the “Product Grouping” example from the “What’s new in QlikView 11.qvw” sample. It’s a great beginner demo of using Alternate States for comparative analysis. [Group 1] as the Set Identifier indicates we want to start with the selections in [Group 1]. We then modify, or add, selections from the default state by referencing each field with the “$::fieldname” syntax. The green [Group 2] bar is created with a similar expression, the only difference being [Group 2] as the Set Identifier. The “$::fieldname” syntax works, but it forces us to list every field. Listing every field can get difficult. Is there an easier, more generic method? Yes, if we redefine the problem as: All selections from the Default state except for [Product Sub Group]. I’m not suggesting the sample is wrong. The “$::” syntax is useful to know and is required when you want to reference only specific fields. I’m posting this alternative because I see people copying this more complex $:: syntax when the simpler syntax would suit their application. Join me at an upcoming Masters Summit for Qlik event in Johannesburg (6-8 Sept) or Austin (10-12 Oct). Oleg Troyansky’s Set Analysis and Advanced Aggregation session provides more useful tips and advanced techniques in using Alternate States.